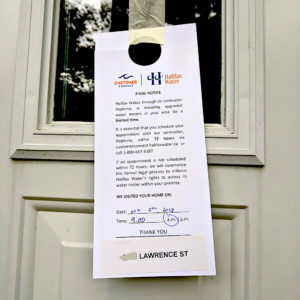 Some residents of West End Halifax arrived home last week to find notices taped to their front doors threatening legal action if they did not book appointments to let Halifax Water install new smart meters within 72 hours, a deadline that expired over the holiday weekend. Smart meters will save the commission millions per year in meter-reading costs, while giving the commission and its customers detailed data about water use, and early warning of water leaks. They’re a good thing. Moreover, the commission faces a big job, replacing 83,000 meters by late 2019 at a cost of $24.5 million. It’s anxious to get on with the job, but customers, including this one, sometimes take their own sweet time getting around to one-off chores like booking appointments to swap out a meter. It’s understandable the commission would want to give non-responding customers a nudge, but the menacing public warning it slapped on customers’ doors is the sort of tactic an aggressive bill collector might employ. This is not appropriate behavior for a public body to take with law-abiding, rate-paying citizens whose only sin is to be slow arranging an appointment that will, for single people and working couples, often entail inconvenience. On Tuesday, I called James Campbell, Halifax Water’s spokesperson, and pointed out that the UARB gave customers the right to opt out of the new meter. Campbell said customers were only allowed to opt out of the radio frequency device on the side of their house, not the meter itself. Later Tuesday, a UARB official confirmed that Campbell’s interpretation is incorrect. An October 2017 clarifying letter from the board made it clear that existing customers could indeed refuse the new meters, and would not be subject to a fee for manual reading of their antiquated meters. Put plainly, the threat of legal action is a falsehood, promulgated by your publicly owned municipal water utility. Halifax Water is an independent corporation established by an act of the legislature. By law, four Halifax regional councillors (currently Lisa Blackburn, Lorelei Nicoll, Russell Walker, Steve Streatch) sit on its eight-member board of directors, as does CAO Jacques Dubé. To my knowledge, none of the councillor-board members has raised any objection to the bullying notice the commission is slapping on customers’ doors. Nor have any of our woke urban councillors, so keen to shape and direct the personal behavior of their constituents. My own councillor, Lindell Smith, didn’t respond to an email request for comment. Indeed, the only councillor to object is Matt Whitman, favorite whipping boy of Halifax lefties. Good for Whitman; shame on the rest. No doubt legal threats are effective. Customers who ignore junk mail notices may snap to attention in the face of an imminent prosecution. Sending heavy-set chaps to the door wearing brass knuckles might be equally effective, but that doesn’t make it right. These things matter because rising populist fury over all aspects of government threatens the bond between government and the governed that makes democracy work. A combination of anemic revenues, aging population, and boundless demand for government services makes Nova Scotia hard to govern. When the Auditor General panders to the Province House press corps with invidious criticism of small, harmless expenditures, and Halifax Water plays the thug with law-abiding customers, it fuels the false perception that all politicians and civil servants are uncaring, self-serving incompetents. This morning I filed a formal complaint with the Utility and Review Board asking them to order Halifax Water to stop posting these notices, and to respond accurately to customers seeking information about their right to opt out of the program.